Ahhhh I love spring. It’s a time where new creations are born. The beautiful budding of trees and flowers. Animals and humans alike, peering their heads out into the dewy world with their tiny new cubs. 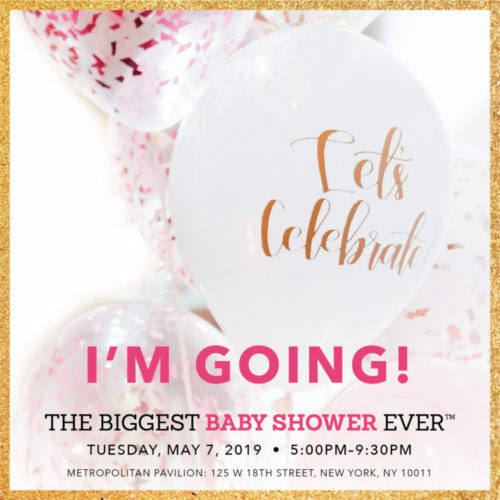 Oh, what a feeling, and the Big City Mom’s Biggest Baby Shower is here just in time with all the newest in baby brands and gear for your little May flowers! So if you are in the New York Metropolitan area and are expecting or even just had a baby, this is where you need to be on May 7th! The Biggest Baby Shower is the largest event for new parents and parents to be. You can test out the newest gear from all of the top baby gear brands before you buy…. and get ready to shop also because they have Big City discounts just for event goers like you. Do you have questions about your new little one? Awesome! There will be tons of seminars on any and everything pregnancy and baby related. Learn from top parenting experts across the country, including healthcare professionals, nutrition experts, and babywearing gurus through their seminar series. Want the deets? Here you go! Wait… I’m not done. If you head on over here to Guilt right now there is the biggest discount on the Biggest Baby Shower where you get admission for 2 PLUS a goodie bag for $60 (normally $100). Hurry though, this is only while supplies last and trust me that won’t be too long. JustABxMom and I will be covering it as well so we can’t wait to see you there. Make sure you tag me on Instagram at JustaNJmom on your cool finds when you get there! If you want to check out some of my favorite finds from last year’s show, check it out here. NY, NJ & CT Have You Gotten Your Noobie Box Yet?